A few Appalachian Trail thru-hikers had a noisy night on the trail amid the killer storms that devastated broad swaths of Alabama and Georgia on Wednesday. It reminded me of some of the harrowing tales of beastly weather I’ve heard over the years. I recall a guy telling me about “nuclear powered lighting strikes” in the High Sierra of California. Not being a Midwesterner, he wasn’t accustomed that unnerving flash and blast some of us grew up with. For me the worst storms happen when I’m asleep; all those evenings in the basement with the tornado sirens wailing — a fixture of growing up in central Illinois — haunted my slumber for decades to come. I’ve dreamed of a thousand twisters for every one I’ve seen in real life. Yeah, I’m grateful. 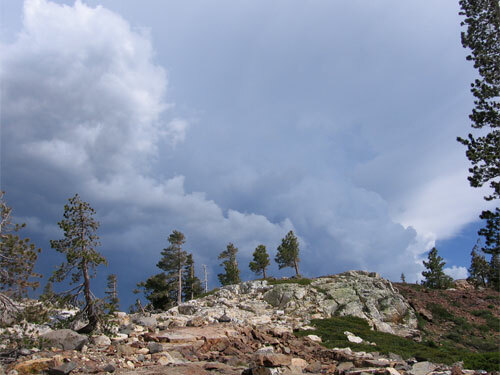 I go out of my way to avoid hiking in bad weather — caution and common sense can eradicate 99 percent of the risk of a day on the trail, but weather trumps it all when the skies go black. If you’ve got any inspiring weather tales or tips for making the best of a stormy situation, please share in the comments. ← Can hiking cure the U.S. health-care crisis? I think our most interesting weather event while out hiking was back when Scott/Morgan Counties in Tennessee where hit by tornadoes back in 2002. We were hiking in the Big South Fork, The Oscar Blevins trail if memory serves me correctly, well it was around the Bandy Creek area for sure. We were on the back side of the loop at the homestead checking out the horses and feeding them grass and the like when we looked off into the distance to see the frontal system moving in from the west. We were a good 1.5 – 2 miles from the trail head and new that within the next couple of hours that system would be in the area. I don’t think we’ve ever hiked that fast before. I picked up Ashby, who at the time was maybe 6 yo, and the three of us made 1.5 miles in about 30 minutes. I still remember to this day driving back home and watching the lightning show out of the car windows. When we got home we sat out on the front porch and watched the light show as it rolled in. We were saddened the next day to find out that a tornado had touched down not more than a few miles of where we were hiking that day and wreaked havoc for the little town. The worst weather I encountered on the trail occurred in Whiteoak Canyon, Shenandoah National Park. A quick moving thunderstorm that packed buckets of rain caught my brother and me about the time we reached the upper falls area on the trail. Did I say buckets? We pulled out the rain gear quickly and managed to keep our packs, and ourselves relatively dry. Despite that, I learned a lesson that day. Even GoreTex boots aren’t of much use if it’s raining so hard that your boots fill from the top. It was raining into my boots! When the rain finally stopped, I dumped 3-4 ounces of water out of each boot. It’s definitely no fun finishing the last few miles of the hike with wet socks and boots. As soon as I got back home, I ordered a pair of gaiters. So now, whenever I hike I take a dry pair of socks and those gaiters with me in my pack. The gaiters are handy for snow hiking as well. Experience is the best teacher. 2 of my friends and I hiked Mt. Monadnock back in February of this year. They had done the Whtie Mountains about 2 weeks prior. The forecast for the day was supposed to be fairly decent, we got to the mountain at 1, got to the summit at about 4:40.. By 5:15 it was getting dark and it began to snow really hard. Luckily we were all fairly familiar with the mountain because the trails became covered in snow and we would have had no idea which was the safe way down. When we finally got below tree line again, the snow had stopped falling and we could just about make out the packed in trail to get down.